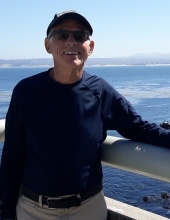 SPARKS - Terry Scott Thomas, who loved golf, tennis, downhill skiing, reading, ice cream, and life, passed away at home in Sparks recently after a lengthy illness. He was 76. Terry was born May 19, 1942 in Denver, CO to parents Kent and Elaine Thomas. As a child, the family moved East, first to Highland Park, IL and then to Westport, CT. He graduated from the University of Bridgeport in Bridgeport, CT with a BA degree in Journalism. Like his father, Terry pursued a career in advertising, beginning with General Electric in upstate New York. Then in New York City he built a successful career as an advertising copywriter. He worked on a diverse roster of national advertising accounts at major agencies and along the way received prestigious creative awards for his writing, including ANDY, One Show, and Hatch awards. He later lived and worked in Hartford, CT; Providence, RI; Boston, MA; and San Francisco before moving to Nevada. He met his future wife, Candice, in Boston and they were married in 1987 at Glen Magna Farms in Danvers, MA. Both were urban gardeners and enjoyed growing vegetables and flowers in their garden at the Fenway Victory Gardens, America’s oldest continuously operating victory garden. Terry was a life-long golfer and enjoyed playing and working part-time at Red Hawk Golf and Resort in Wingfield Springs where he lived for more than 8 years. Prior to that, he worked for several years at the Presidio Golf Course in San Francisco after retiring from the advertising business in 2001. In addition to golf, Terry played tennis for many years and was a member of the Boston Athletic Club. He was also an avid downhill skier. Aside from ski trips to Colorado, Wyoming, California, Utah, Nevada, and Canada, he could be found most weekends in the winter on the slopes of Mad River Glen in Vermont where his family had a ski house. Later, while living in San Francisco, Terry developed an interest in motorcycles and regional road trips which he continued to enjoy after moving to Nevada. Terry had a big smile and a warm heart, and he will be sorely missed by those who knew him. He is survived by his wife of 31 years, Candice Schubert; a son and granddaughter in Utah; a brother and sister in Connecticut; a nephew and numerous nieces. He is preceded in death by his parents and an infant son. Special thanks to Dr. Suresh Reddy of Cancer Care Specialists and his nursing and support staff, the wonderful nurses in the Oncology unit at St. Mary’s Regional Medical Center, and Infinity Hospice Care. Because Terry loved nature and living in this beautiful place he called home, please consider a donation to Sierra Club Toiyabe Chapter, Lahonton Audubon Society, or Best Friends Animal Society in Kanab, Utah, in lieu of flowers. To send flowers or a remembrance gift to the family of Terry Scott Thomas, please visit our Tribute Store. "Email Address" would like to share the life celebration of Terry Scott Thomas. Click on the "link" to go to share a favorite memory or leave a condolence message for the family.